We are actually putting our events on hold as we prepare for Dragonfest Expo. 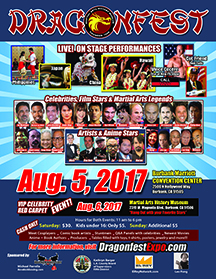 August 5, 2017 – Dragonfest Expo at the Burbank Marriott Convention Center. With nearly 100 booths and twice to three times the size as last year, a ton of celebrities, icons and a host of cultural performances, you will truly enjoy this fundraising event. This is our biggest event for the museum and we hope everyone will be part of this as we raise funds to begin our process of moving into a larger location. But we cannot do it with your attendance at this event. Even if you have come before, come especially to this one. The future of the museum is in your hands and I know we can count on you. Visit www.Dragonfestexpo.com. August 6, 2017 – Dragonfest VIP CELEBRITY Event. This is a huge, red carpet, VIP event at the museum. There, you can meet many of the celebrities on a more intimate environment, see the museum, take pictures with everyone, it will be a blast.